Hello! Welcome, welcome! New week, I hope you’re all doing fabulously well and are ready to dive into episode 3 – It’s not about you. So this is a topic that comes up a lot…like a lot, a lot. As human beings we’re really interested in other people. We have a lot of thoughts about them just as they have a lot of thoughts about us. We observe others all the time, while driving, at school, church, at home, on social media, watching a movie, going on a walk outside in your neighborhood, shopping, if there’s people around we’re having thoughts about them. This isn’t a bad thing. People are interesting. We’re drawn to watch and observe others because this is one way we learn. We see how other people do things and we have thoughts about that. We see people doing things and we think, I want to try that. I think I could be good at it too. Or we see people that are just optimistic and happy and we think, how can I be more like that? We learn from watching and observing other people. We also learn things we don’t like by watching and observing other people. There used to be this show that I saw a few times when I was much younger called Fear Factor. Not my favorite show. They’d have people eat disgusting bugs and I’d cringe and think, “nope…not liking that.” Or they’d have people try stunts like, how long could you hold your breath under water if you were trapped under water and you’d automatically put yourself there and question if you could do that if you needed to. Watching and observing others isn’t a bad thing. It helps us navigate our world, culture, society. We learn new things, behaviors, and get an idea of our preferences, what we like and what we don’t like or don’t prefer. And this is where we start to get in a bit of a hole. Did you catch that? This FEAR that we won’t be accepted fuels the existential anxiety that has become the hallmark of our generation…which then leads to lots of other issues: people pleasing, trying too hard, not being authentic because we’re too afraid to be vulnerable, or hiding because we think it’s easier and less risky. This fear creates a lot of drama and chatter in our heads and it becomes the filter with which we start to see and color our world. We can’t just let others observe and learn from watching us we have to KNOW what they’re thinking and it better be something good, right? I speak to a lot of clients about friends. Sometimes it’s even about family and there’s a lot of pain that my clients bring to me because they had a good friend that now doesn’t speak to them and they’re worried what could have happened that made them shy away of become distant or not want to be friends with them anymore. There’s clients that struggle because they used to have a close relationship with a family member and now they don’t and they spin thought after though after thought trying to find the answer to why. Why don’t they like me? Why don’t they want to be around me? What’s wrong with me? They turn the circumstance into something painful about themselves. If they liked me then they’d call. If I was important, special, more fun then I’d have more friends. They’d WANT to be around me…and because I don’t…then something must be wrong with me. If you’ve ever thought or felt any of these things I just want to tell you, you’re not alone, my friends. You’re not alone. Why do we care so much about what other people think? How can we stop caring so much? and what can we do to keep moving forward and not getting stuck in our own internal drama all the time? I think it’s important to watch out for the idea that we can STOP caring what others think of us. I don’t think I want to ever get to that space where I don’t care anymore because I don’t want to be indifferent to others. I want to value what my family thinks of me. I want to hear and acknowledge what my friends, clients, and others think. But I also don’t want to crumble and fall apart every time criticism comes up. We care because we are Children of God. Because we have and operate from our innate virtues of humility, kindness, and civility. I don’t think we want to get that point where we discount other’s opinions entirely. So how can we get to a place where we can let other’s be themselves, and yes, say and do things we don’t agree with or understand while not falling apart inside and thinking inwardly about it too much? How can we stop caring SO much? What can we do so that we CAN show up as genuine, vulnerable, REAL and not be tossed to and fro with each opinion, look, and comment from others? The first step is realizing that you’re in charge of your own emotional bucket. Go back and listen to episode 1 on the bucket if your confused. You have to take ownership that you’re the only one with access to your bucket. What others say or do cannot hurt you or offend you. If they could it would make you “an agent to be acted upon” and not an “agent to act” – or in other words, a game piece that can be moved against your will, wherever the circumstance wants to take you. We’d lose our free agency if this were the case and thankfully that is NOT part of the great plan of happiness. The beautiful, glorious gift of our free agency gives us that power and authority over our buckets. So in navigating this world with lots of people in it always, always remember that you’re the only one that gets to add or take from your bucket. It’s right there. You’re in charge of what goes in your bucket. Fill your own bucket and the more you do, confidence increases and what others say or do won’t bother you as much. It offers you freedom to hear their opinions and decide if you want to believe them or not. It gives you an opportunity to decide if you want to tweak how you’re operating or think, no, I’m good here. Okay, so step one: Always take ownership and responsibility for your bucket and the filling of your bucket. TWO: Figure out what it is that’s REALLY bothering you. It’s not that your friend stopped calling you. It’s the meaning you place on that circumstance. Why isn’t she calling? she used to call. Did I do something wrong? Does she not like me anymore? Something must be wrong with me. We internalize these moments and create a lot of drama about them…and we take it to great extremes too. When my daughter was just a year and half so like, 14 years ago, we moved to a new area and there was this playdate scheduled with a bunch of mom’s and their kids so I went thinking it might be a good place to meet new people and make friends. So I show up and there’s a few mom’s there with their toddlers and no one is talking to me. I smile at some and they smile back but then they go right back to talking to who they already know. In my mind I had lots of thoughts: Why aren’t they talking to me? Do they not like me? Do I look funny? Why don’t they want to talk to me? I’m new here. As the guest someone should say hi to me first. Maybe they don’t like me and they don’t want to get to know me. Maybe if I were…cuter, skinnier, funnier, more…whatever they’d reach out. Maybe then they’d like me. Maybe they think I’m weird. Anxiety, anxiety, anxiety…and then the FEAR thought: Something must be wrong with me. We stayed a total of 20 minutes. Not enough time to even wait to see who all was going to show up and who knows, if I stayed maybe I would have met a really nice person to hang out with but I was so caught up in FEAR that I wasn’t being accepted and therefore something must be wrong with me. Do you see how quickly we tend to make that huge leap? Something starts off small, like this case: no one saying hi – which, I don’t even think I said hi either but my mind went wild with thoughts which created my anxiety, which caused my actions to get out of there as quickly as possible which didn’t help the reason I went there in the first place which was to make friends! I took the circumstance: No one talking and added a lot of thoughts which ended with: Something must be wrong with me. Logically hearing it back it sounds silly but in our minds we do it all the time. I wasn’t claiming ownership of my bucket. I was waiting for them to say or do something nice and include me for me to feel worthy to be there, to feel accepted, to feel of value and when they didn’t I interpreted their quietness as something hostile and negative about me. What really worries us, causes us pain is that those thoughts we have internally might be right, it’s when we believe that something is wrong with us, that something needs to change that creates pain, fear, and anxiety. So step two: Do some digging and ask yourself WHY their actions, words, thoughts, or opinions matter to you. Locate the problem. Find out why it’s causing you so much pain, anxiety, and fear. Doing a brain dump is really helpful when you’re doing this second step. Grab that sheet of paper and just start writing everything. The real problem will be found and then you can address it. Which leads us to step three and the last thing I’m going to touch on today…What other’s do, think, or say IS NOT ABOUT YOU. We’re really skilled at making things about us. Like we’d all have a blackbelt in this area because we’re all so stinking good at it. When those mom’s were quiet I immediately made it about me – I made it mean that they’re quiet because they don’t want to talk to me. Did I really know that? No. Maybe it was their first time too being there and they’re interpreting my silence as negative about them! and we’re both there ruminating about what we believe each other are thinking! I couldn’t even entertain any thoughts like “Maybe this is their first time here. Maybe I should say Hi first.” because I was too busy making it mean all kinds of things abut me! I love the advice the Ancient One give’s Dr. Strange in that Marvel movie. She said, “It’s NOT ABOUT YOU.” She says it early in his training but it’s also her last piece of advice to him. The last thing she wanted him so desperately to know. 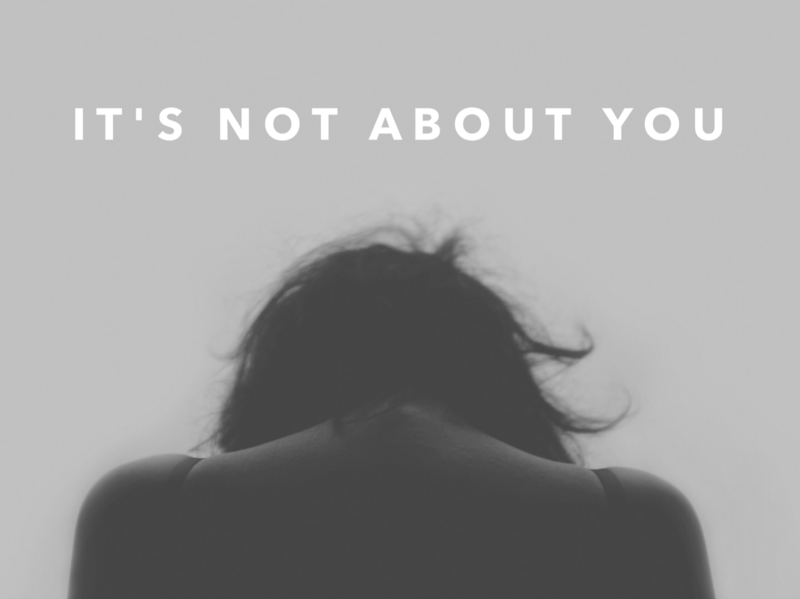 It’s not about you, because it’s not. Too often we internalize everything other people say or do and make it mean all kinds of things about us and this is totally inaccurate because what they’re saying or doing has nothing to do with you. It has everything to do with them, their day, their past experiences, how they’re feeling. Even if they look right at you and say words to you it still has nothing to do with you. Nothing. What they’re experiencing has everything to do with them. It’s not about you. I promise. If they’re mad, offended, hurt, or whatever they’re feeling – it has nothing to do with you. They have their agency to interpret your actions and decide what they want to make it mean just like you interpret their actions, words and decide what you’re going to make it mean. We strive so hard to live in a way where everyone would like us. If they liked us then we could feel good about ourselves and the world would be this blissful place, right? But there are over 7 billion people on earth with over 7 billion thoughts, preferences, perceptions. There’s going to be differing opinions. There are going to be people that don’t like you, and that’s okay. There are going to be people that don’t agree with you, and that’s okay. There are going to be people that don’t want to talk to you and THAT’S OKAY. It’s NOT ABOUT YOU. Them not liking you isn’t about you. It’s about them. It’s about their preferences and what’s going on in their lives. Just because someone doesn’t like peaches does that automatically mean that something is wrong with the peach? NO. The peach is perfect at being a peach. I personally think grapefruit is disgusting. I think it’s beautiful, it even smells good but I do not want to eat it ever. I think it’s gross. If the grapefruit could think it could easily make my thoughts and my comments about itself right? It could think things like, she doesn’t like me, something must be wrong with me. But is there something wrong with the grapefruit? No. The grapefruit is perfect at being a grapefruit. My thoughts and comments have everything to do with me, my preferences, my tastes, and opinions. Nothing is wrong with me either. We’re just different. In fact, I have a family member that LOVES grapefruit. He’s not offended that I don’t like grapefruit because it’s not about him. My actions, preferences, thoughts have everything to do with me. Take the Ancient One’s advice and remember, what others do, say, think, or feel is not about you. You are perfect at being you. Right now, nothing needs to be fixed, changed, altered for you to be perfect and whole, valuable, and accepted. You are a child of God and you are perfect at such. This isn’t to say that we stop trying to become more if we’re perfect already. We’re always wanting to refine ourselves and grow but it’s not because something is wrong with us it’s because we’re ready and capable of learning more. 1.) Take ownership of your emotional bucket and the responsibility to FILL your own bucket. 2.) Locate what the real problem is. Why does their actions, words, thoughts bother you? Why is it causing you anxiety and fear? 3.) Remember, it’s not about you. What they say or do or even think is not about you but about them. These three steps will offer you so much freedom to live authentically. To show up in any situation as your best self. To give the gift of your own uniqueness to the world. You got this my friends! Have a great week!